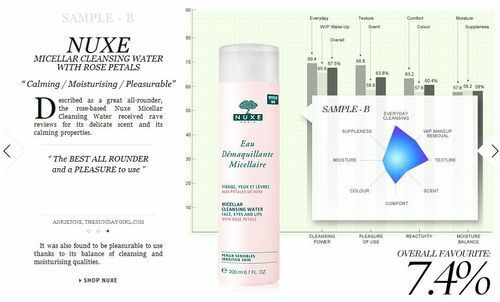 On 13th May I popped up a brief post to let my readers know that I was part of the escentuals.com Micellar Water Blind Trial. 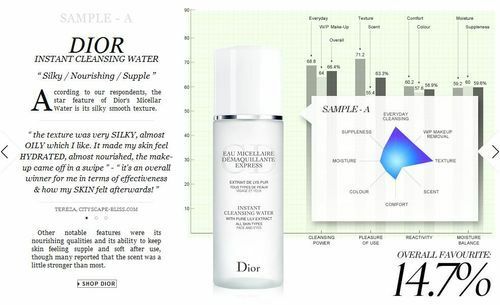 As a brief recap the trial involved 100 beauty fans/experts using 7 anonymous micellar water samples over 14 days. On 24th May I then posted my thought’s on each of the samples and revealed which of the samples I preferred. 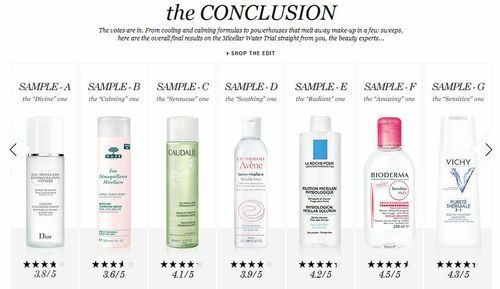 Yesterday Escentuals released the results of the trial including which sample was which, what people thought about each one and which one was the most popular overall. 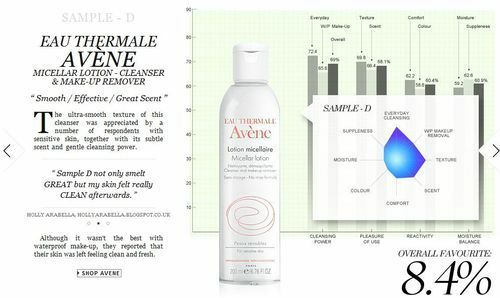 You can see full details of the results and bigger versions of the screenshots included below on escentuals.com here. This was one of my top three but was actually one of the least favourite across the trial coming in at number 6. This one felt slightly oily to me which I wasn’t keen on but it was really fresh to use, removed my makeup quickly and easily and only very slightly dried my skin. This was the least favourite of the trial and I’m not surprised as it was also one of my least favourite. I found this had quite a strong scent that I wasn’t keen on, it took a long time to remove my makeup, left my skin feeling quite tight afterwards and I think this actually exaggerated my redness. This was personally my favourite of all the samples but it only came 4th overall. I found this one really fresh and lovely to use. It removed my makeup quickly and easily and didn’t dry my skin at all but left it feeling soft. This was my least favourite of all the samples however this came in at 5th overall. This had a nice light scent that I liked and I thought it removed my makeup quite well but my skin started to become sore as I used it and afterwards my skin felt dry, tight and uncomfortable. I finished the other samples after the trial but I actually threw this one away because it just made my skin too uncomfortable. I found this one just ok, nothing special really but this one came 3rd overall. It removed my makeup quickly but struggled with my mascara and dried my forehead out a little. This sample was one of my favourites, was the overall winner of the blind trial and turned out to be the beauty lovers cult favourite Bioderma! This one was nice to apply, removed my makeup well, didn’t dry my skin and left it feeling quite soft. I found this one ok but it came out 2nd overall. This removed my makeup quite well although struggled with my mascara and left my skin feeling quite dry and tight. I found it quite interesting that despite having sensitive skin, the ones that came out as ‘Calming’,’Soothing’ and ‘Sensitive’ were my least favourite and the ones that actually made my skin the most uncomfortable. 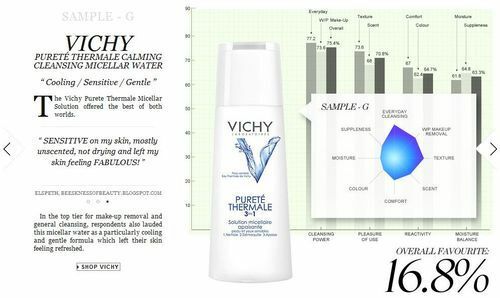 It’s also very interesting that despite being a blind trial the beauty bloggers holy grail micellar water Bioderma came out on top. 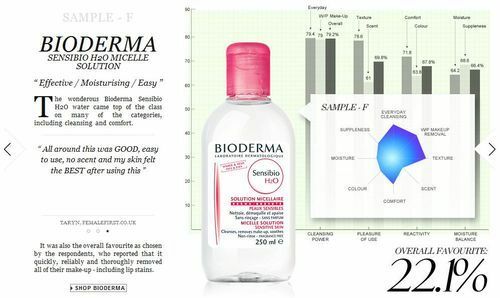 Bioderma is also the cheapest despite being available in a 250ml bottle whereas the others are available in a 200ml bottle. 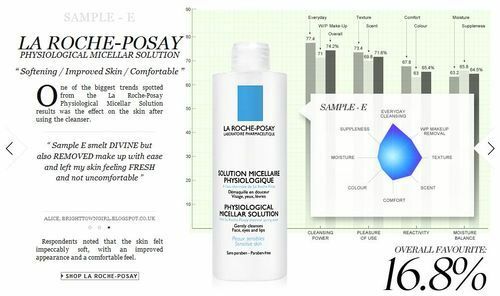 So the moral of this story is…..yes, Bioderma really is worth the hype!